Police claimed Mr Haw, 57, from Redditch, Worcestershire, posed a threat as terrorists could hide bombs under his many banners and placards. But District Judge Quentin Purdy said he had not breached conditions imposed on him by the Metropolitan Police (Met) as they were unclear and invalid. Mr Haw has held a continuous vigil outside Parliament since 2 June 2001. He was accused of failing to comply with conditions imposed under the new Serious Organised Crime and Police Act (Socpa), which puts limits on demonstrations within 1km of the Houses of Parliament. The new law rules that all demonstrations in that area need police permission. Mr Haw had won a legal ruling that as his vigil pre-dated the law, it did not apply to him. But that decision was overturned by the Court of Appeal. 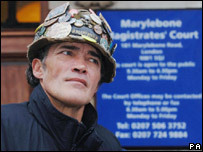 A police officer put restrictions on him, under Socpa, on 8 May 2006 which included limiting his protest to within an area 3m wide by 3m high and 1m deep. Then on 23 May last year about 90% of placards erected by Mr Haw were seized in a police raid. The Met claimed he had breached the conditions. Mr Haw continued his protest but with a much reduced presence opposite the Houses of Parliament, as the police took him to court for breaching the conditions. At a previous hearing at Marylebone Magistrates' Court, police said they imposed the order as they feared terrorists could plant bombs in them without Mr Haw knowing. But applause broke out at the City of Westminster Magistrates' Court on Monday when Mr Purdy said those conditions were invalid as they lacked clarity. Mr Purdy added that the imposed conditions were not legitimate as they should have been ordered by Metropolitan Police Commissioner Sir Ian Blair, rather than an officer from a lower rank. He said: "I find the Commissioner cannot delegate his powers under Socpa as he purported to do. After the hearing, Mr Haw said: "We won as we should have done because it was wrong and the police were wrong. "I am a peaceful person. These conditions were absolutely incredible - just ridiculous."